As we all know, Indiana winters can be brutal, especially for golfers who want to get out and practice their game. But now, with Golf365 in Noblesville, you no longer have to take four months off from golf. Junior Golfer, Clay Merchent, and Purgatory’s Director of Golf, Mike Merchent, show you around the indoor golf facility, from the putting greens and target rooms to the golf simulator, in the video below. Purgatory Golf Club’s owner and Golf Professional, Mike Merchent, is going to take a former athlete with little golf experience, Tony Adragna, and transform his golf game over the course of the winter. This will be documented through our series, Changing Your Golf Game. In lesson 4, Mike continues refining Tony’s Elbow Drill, this time really focusing on Tony’s hip movement on his downswing. So far, Mike and Tony have gone through three lessons, and Tony’s posture and pivot have already started to dramatically change. To view each of the three lessons, see below. In lesson two, Mike refines Tony’s elbow drill and gives him some other tips and pointers to help his swing. Video is provided below. elbow drill. See how he is doing and get an update here. through it right now. Just stand up there naturally and go through your progressions. we’ve worked on last week in the elbow drill and refining it a little bit, okay? bending more from your hips. Okay. A little bit more on that. Okay there you go. That’s position one. Now from position one to two let’s clean this up. Mike Merchant: This right knee, or this left knee right here is gonna stay right there. You’re not gonna let that left knee get outside of that left foot. Okay. I’m gonna ask you to flatten your left foot. See how it pulled that knee a little bit? go ahead and rotate on up and through. Mike Merchent: Okay? One more time. Mike Merchent: is that accurate? straight line relationship right there. But you do not get outside of that left foot. gonna get outside of our feet. Okay? Our head, wer’e not gonna rock over here. We’re not gonna let the knee bow out and let the hip get out on either direction. that weight right there in that left foot that left knee. Now it’s over on my right foot. Mike Merchent: Okay, that’s good stance width right there. Got the club back there. relationship and you’re behind the ball. Okay? you to recognize that you’re in a very similar position as you were at address. you go. Now that’s impact. And then rotate through. There you go. Put that basketball in between your two legs. And not in your knees as much. keeps your thigh separated. Okay now, you just bumped outside a little too much. doesn’t let your knees get as wobbly Okay? Mike Merchent: Doesn’t let your knees collapse on you. Okay? week. This is lesson number two, getting a little more specific in the elbow drill. Watch Tony. He is gonna get better. You imitate it at home, you’ll get better too. In this video Director of Golf Mike Merchent explains why junior golfer, Clay, is hitting his ball off the toe. It turns out that he is coming out of his posture as he rotates his hips, and as a result is pulling his shoulders and arms up. End result, hitting it off the toe. To fix it, he focuses his student on his left heal because it was also coming up and “flying out”. By keeping his left heal on the ground as he clears his hip, the end result is he stays in his posture, keeps his shoulders & arms in proper swing plane, and hits the ball more in the center of the face, or the “sweet spot”. To view a transcript for this video, click here. Tony Adragna is a former high school basketball player that has played the game of golf a couple of times a year, but would like to get more serious about it. Tony has had no golf training, and his game reflects that. With that said, Purgatory Golf Owner and PGA Professional, Mike Merchent, is ready to help Tony transform his golf game. In this series, “Changing Your Golf Game,” Tony and Mike will work on Tony’s game throughout the winter, so by the time spring rolls around, Tony will be on the right path to being a better golfer. In episode one, Mike shows Tony some very basic drills to help clean up Tony’s form, and the two of them take a look at Tony’s swing in slow-motion to pinpoint where some of the problems lie. Look for new episodes each week. Tony improve his game. Ok Tony, do you play much golf? hundred like I said, I’m pretty happy. right which most of the time probably isn’t the right case. Mike Merchent: Ok so everything you do is instinctive. Mike Merchent: When you think about anything, about how to grip the club. I’ve held that grip ever since. Tony Adragna: Yup. All feels good. questions. But I’m just gonna observe right now. that flag down there, you see the closest one to us? Mike Merchent: That’s our primary line. easy, make a couple of swings as if you’re gonna hit it, 15 or 20 yards. and we’ll move forward from there. arms, they’re in perfect position right there. It’s parallel to your target line. how you’ve been over a little bit more. So you actually increase that angle. back is still, it’s in a good position. I still like that posture with your back. come on through you can see you really released in the step of your left foot. as you are, you can do that. If I try to do that, I’d be in the hospital bed. right there you start to bend over the more. Your right knee is kicking in. ball than you have behind it. Okay? But your shoulder have rotated well. right knee is really kicked in on you there, okay? But phenomenally enough. there’s really not much bend there anymore. You’ve got the club right there. which is not so good. But that’s understandable given what you’re doing. you do what we asked you to do, I won’t be surprised. your knee so much. And this go ahead, start slowly..
that feel like to you? Mike Merchent: Okay. Can you, assign a label to it? Can you repeat that? Tony Adragna: I think so. feels like. But I can tell you that what you’re doing is putting you in the right road. not how you’ll do it. Maybe just do gravitate right to it, you won’t have any problem. my knees are bend down much are they? Mike Merchent: I’m bending from my hip sockets. That’s how you get to the ball. you to focus on. I’d like you to focus on that weight predominantly on your left foot. and down, this is your finish. up. When your fist are up, pulls shoulders back, doesn’t it? weight in my right foot. right foot. There you go. And then rotate on up and through, Hold that right there. the ground. See how much you shift it to your left foot? you to really focus on. Okay? You do it slow enough that you control the motion. into your left hip. Point club at the ball. Hold that right there. Flatten this left foot. Don’t shift your weight back to your right foot when you do that. There you go. time and I’ll gonna help you out here a little bit. Mike Merchent: Okay, just shift a little bit to your left foot. Point club at the ball. Keep that left foot on the ground. Okay, now shift to your right foot. Hold that there. where you’re hitting the ball. when you come out next spring, you’re gonna break a hundred. Mike Merchent, Director of Golf at Purgatory Golf Club, demonstrates proper golf posture & setup. He shows quite clearly that the posture is the same whether you are using a sand iron or your driver. The hand and arms should always be in the same position. Hi everybody, my name’s Mike Merchent, I’m the director of golf here at Purgatory Golf Club, this is Clay Merchent, Clay is going to assist me today, and today we’re going to talk about posture and setup. Now first, with posture, here’s what we want to do: we want to make sure that we bend from our hips, slightly bending our knees. Or you could go with the opposite – you could slightly bend your knees and then bend from your hips, but we want to make sure we bend from our hips. We don’t want to bend our knees too much, we don’t want to bend over too much. So Clay’s going to show me here his posture. Okay, you can see Clay’s got a little bit of knee flex, his back’s pretty flat, and he’s bending over from his hips. That’s perfect. Now, he gets to that position, just stand straight up, put your arms to your side. Now, slightly bend your knees, and then bend over from your hips, and then let your arms fall. Now you can see, as Clay just relaxes and his arms fall, that’s right where he’s going to hold the club, because his hands are directly below his shoulders, and that’s what you want. So that’s really good posture, a nice flat back, slightly bending your knees. Now, from a good posture position, we’re going to add his sand wedge to this. Now the sand wedge, that’s his shortest club in the bag. So the ball’s going to be a little closer to him, more towards the center of his stance, and you can see, as he sets up to it, go ahead and stay set up there, hands right below his shoulders, back’s nice and flat, slightly bending his knees. Now, keep a hold of your sand wedge there, I’m just going to lay your five iron right on top of you here. That’s where he would hold his five iron. And as you can see, his hand position doesn’t change, still right below his shoulders, he doesn’t reach for it, he doesn’t bend over any additional from his hips, so he’s in the same position with his five iron as he is with his sand wedge, and then we can add the driver, and you’ll find that the same thing applies here. The club’s going to be in the same position as it was with his sand wedge and his five iron, except the ball is a little bit further away from him, is a little bit more towards the instep of his left foot. So, hopefully the question that we answered there is “How do you set up to the ball?” “What’s your posture supposed to look like?” and “Does my posture change with the clubs?” And the answer is no. A sand wedge, a five iron, a driver, if you’re making it a full swing, you’re going to be set up the very same: bend from the hips, slightly bended knees, arms directly below your shoulders, and you just change whatever club that you want, whether it’s a sand wedge, five iron or driver, or anything in between, and it’s the same position every time. So once you’ve established good posture, and you’ve made a habit out of that, it will never change. You’ll maintain that posture through your setup position for the rest of your golfing career. Well, we want to thank you all for joining us today. This is Clay, I’m Mike, we’re here at Purgatory Golf Club. We’ll see you next time. As Mike Merchent puts it, the Elbow Drill is one of the most beneficial drills he has ever used. In the videos below, Mike shows you how to effectively perform the Elbow Drill and also the Elbow Drill with hip variation, and extensively explains why the drill is beneficial, and how to effectively perform it. Posture and pivot. We’ve heard those terms a lot in golf. Well today, I’m going to show you a drill that will help you isolate those 2 fundamentals of the golf swing. Hi everybody, my name’s Mike Merchent. I’m coming to you from Purgatory Golf Club here in Noblesville, Indiana. The drill that I’m’ going to show you today is the elbow drill. This is a fantastic drill. It helps you with your posture, and it helps you with your pivot. First is the posture portion of it. What I’m going to do is I’m going to stand up here, I’m going to take this club, I’m going to place it behind my back in my elbows. Alright. Now right there, I’ve solved my posture issues. It’s going to force me to have a nice, straight, flat back. Then I’m going to bend from my hips, slightly bending my knees. Alright, this is my address position. My posture is perfect, and from this position, which is both called position number 1 or address, we set up to a simulated ball position, hold this for 3-5 seconds. Now from here, I’m going to shift to my right side, I’m going to point the club-face part of the club down toward the ball. Now here, I’ve got a nice stretch going, got my weight predominantly on my right side here, club’s pointing at or slightly behind the ball position. This the top of the backswing. Now, the forward part of the swing, I’m going to do in the elbow drill very much like I do in the golf swing, I shift the weight to my left foot, rotating my hips over to my left side, pointing this part of the club at or slightly behind the ball. This is either impact or slightly after impact. And then the fourth segment of this drill, I continue rotating with my hips and shoulders, where I’m looking down toward my target line, I’m standing straight up. All right, we’re going to do this one more time. 1, 2, weight on the right side, club pointed at the ball, 3, shift the weight to my left side, point the club at the ball, 4, rotate on and through. Okay. So this elbow drill, it’s really basic, very easy. Will help you with your posture, it will help you with your pivot. If you work on this drill every day before you hit shots, it’s a great way to get some heat in your muscles, get you warmed up a little bit. Try this drill, I hope it helps. By now, you’ve seen me do the elbow drill. Today I’m going to show you just a little bit of an addition to the elbow drill that will help you isolate a particular part of your swing that I think is very, very important. Hi everybody, my name’s Mike Merchent, I’m coming to you from Purgatory Golf Club here in Noblesville, Indiana. The elbow drill, just to refresh your memory on the elbow drill, the club goes behind your back in your elbows. This forces you to have great posture. Nice, flat back here. Then I set up to the ball here, slightly bending my knees. This is position number 1, hold this for 3-5 seconds, then position number 2, weight shifts to my right foot, club’s pointing at or slightly behind the ball position – this really helps you with your flexibility and stretching. Position number 3, shift your weight to your left foot just like you do in your golf swing, point the club at or slightly behind the ball position, and then position 4, continue to rotate with your hips and shoulders to a finished position. Hold each one of these positions for 3-5 seconds, it’s a great way to start your practice session. You’re going to stretch your muscles a little bit, get a little bit of heat in them, it’s just a great way to start your practice session. But today, I’m going to add a little spin to that. Just like the elbow drill helps you with your posture and your pivot, this, just take a little bit of bungee cord here or surgical tubing, this is going to help you with your hips. Everybody wants to know “How do I move my hips in the golf swing?” Well, we’re going to show you today. Alright, you take this, and you hook this surgical tubing up right across the front of your hips, and as you can see, this really simulates the position that my hips are in. I do that, I add the club behind my back like I do in the elbow drill. Okay. We set up. We’re over the ball. Okay, perfect. This is position 1. From position 1 to position 2, we shift to our right, we point the club at or slightly behind the ball position. Notice how the club and my shoulders goes further to the right than the club attached to my hips. That means my shoulders are rotating more than my hips. Okay, now here’s where the magic comes, going from position 2 to position 3. I want to make sure that I get this club here attached to my hips to shift and move first and more than the club behind my shoulders. Alright. So notice this: That this club to my hips is pointing a little bit behind the golf ball, but the club behind my shoulders is way behind the golf ball. Now let’s look at it from the side view here. Now notice how this club here is pointed a lot further in front of me than the club behind my back and my elbows. What does that do? Well that’s the shoulder-hip separation that’s so critical in starting your downswing. We don’t start our downswing with our upper body, we start our downswing with our hips, we swing from the inside out, not from the circumference in. We’re at the top of our backswing, we want to now, as we start down, we want to move this club on our hips, we want our hips to move. Our hips are going to shift to the left and they’re going to rotate. Now notice how this club is leading now. This is a perfect position right here to, an isolation of the hips, and how the hips are supposed to move. And then, as you move through your swing, you keep the hips moving and the shoulders moving and they eventually pair up. The shoulders will actually move a little bit more coming through and then they’ll recoil back. But what you can do when you set up like this, just to free your hips up and just to isolate those hips so that you realize that they’re a really huge factor in the quality of your golf swing, just rotate your hips separate of your shoulders. It looks easier than it is, but I’ve been doing it a long time. Okay, let’s do this one more time. We’re going to go to the top of our backswing and stop, then I’m going to shift my hips and rotate my hips, and look, I get that club started first, and then rotate through. Most people do the exact opposite – they get to the top of their backswing, and *whoop*, the shoulders just come right over, get in front of their hips. Now you get into the same position eventually, but your sequence is all off. So this isolates the hips, gets your hips to move first. You don’t want your hips to trail, you want your hips to lead. So this is a little spin on the elbow drill, I don’t have a title for it yet, I don’t have a name for it yet, but I will soon. Try this; if you slice the ball a lot, there’s a good chance you’re coming over the top of it, which, there’s a good chance you’re doing that with your upper body. You need to learn how to use your hips, you need to learn how to isolate your hips, you need to learn how to get your hips moving first before your shoulders. Try this drill for a while, see if it helps you isolate your hips, see if it helps you with your slice. 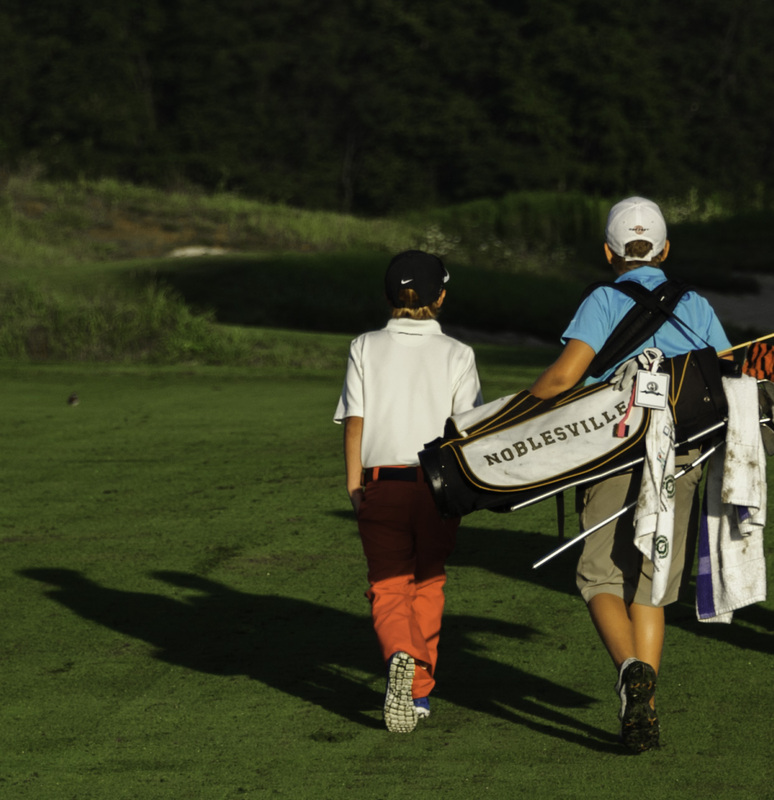 Two junior golf clinics are scheduled at Purgatory Golf Club in July. The first clinic will be July 8 to July 11 and the second will be July 16 to July 19. The four day sessions are from 9 am to 10:45 am and are geared for ages 6 to 14. Each clinic includes a PGA professional instruction in all areas, exposure to the golf course, participation awards and prizes, with a competition event and lunch on the last day. “We focus on the fundamentals of golf but we also make sure to have a bit of fun along the way,” said Jon Stutz, head professional. The cost is $90 for the first child and $70 for each additional child. The entry fee is $70 if the junior golfer is enrolled in both July clinics. For more information contact the pro shop at 776-4653. This golf lesson with Mike Merchent is our most watched video on our YouTube channel. He will be conducting a golf instruction training session Tuesday, April 9th at 11:30 a.m. for our staff. A maximum of 20 guests will be able to attend, free of charge. I can honestly say that Mike understands the golf swing better than any other golf instructor I have met, seen on TV, or heard speak. Unfortunately he doesn’t have the time to provide personal instruction these days, the whole running a golf course thing gets in the way. So this is a great opportunity for you to learn from him 1st hand. If you’d like to attend, please contact the proshop 317-776-4653, ext. 1. Mike will be conducting these internal training sessions once a month, leave a comment if you’d like to be one of the golf swings he uses in a training session. PS. This is a change, originally he was to conduct the training next week. Due to a scheduling conflict, Jon Stutz will instead be discussing the Rules of Golf and water hazards next Tuesday at 11:30. Please call the proshop if you’d like to join us for the Rules discussion & training.